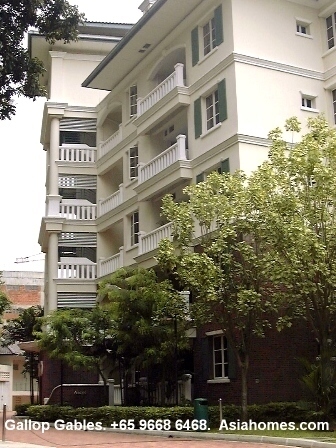 80 Farrer Road. 140 units. 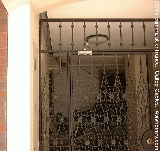 Completed 1998. 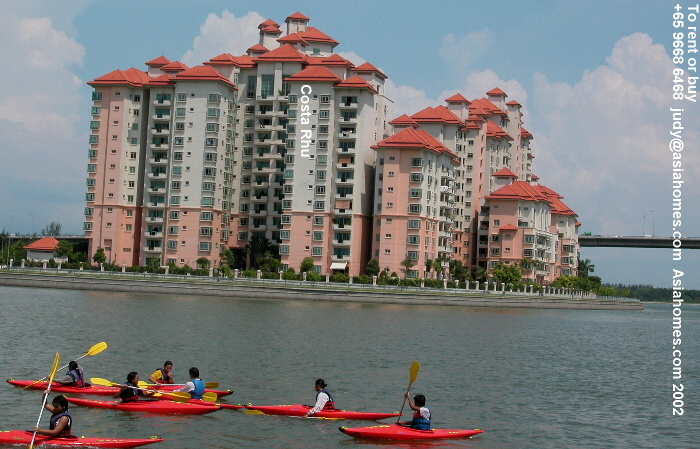 Most units have been sold as at Jul 2009. Site area: 269,000 sq. ft, next to the Botanic Gardens. Freehold. Low rise, low density of 140 units, big balconies, cable points in all rooms including the maid's room, sprawling grounds, basement store room. Picture shows big balconies and the private enclosed space of the ground floor unit (hidden by shrubs). 267 sq. m (Type A3b) or 2,873 sq. ft.
Each bedroom has an attached bath. Master bathroom has shower stall as well as white long bath and dual basin. The size of the utility room or maid's room is sufficient to install a mattress and bed. Living/dining - light brown marble tiles with dark brown borders. teak parquet. Rooms are squarish and therefore good for positioning of beds. The master bedroom of the 4-bedroom units are slightly trapezoid in shape. Black gas cooker hob & stainless steel hood. Black oven. Audio-visual intercom system. Dual basin in master bathroom for 4+study units. Spacious utility area for big washing machine, dryer & dish washer. Swimming pool, children's pool, jacuzzi pool, tennis court, big gym next to table tennis room (which can be used as a function room), squash court, mini-mart. 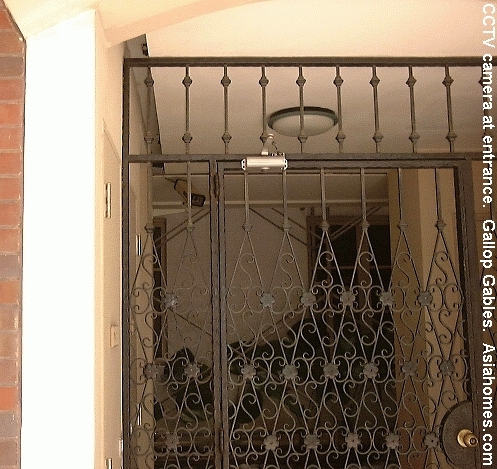 24-hour security system with closed-circuit TV at lift lobbies and card access system in lifts to your apartment. Children's playground. Underground car park with direct card access to the apartment. Multi-function room (table tennis table), jogging track. Sprawling landscaped grounds for children to run about. Landscaped gazebo (windowed balcony or summerhouse from which one can gaze at the surrounding scenery). Pergola with barbecue pits. Changing rooms with saunas (one for male and one for female). Underground car park storeroom of 60 sq. ft for each apartment to store your golf sets or other belongings. The 4+study unit has one store room. Cable TV connections to all the rooms including maid's room. Architectural design said to be similar to London's Belgravia & Knightsbridge apartments. 10-15 minute bus ride to most International Schools. 3-minute drive to Orchard Road or Holland Village. Low density and low rise. Big balconies - sufficient space for barbecue set and table with 4 chairs. Most Caucasians just fall in love with this balcony especially if they front the greenery. Open pool deck with plenty of sunshine for a good sun tan. 5-bedrooms on 4th floor have bigger balconies. Most new condos have very small balconies. Big patio and a small garden plot for the ground floor units. Large enclave of European and American families. Botanic Gardens, Holland Village (a popular expat meeting food and beverage area) and Tanglin Mall are round the corner. Takes about a 2-minute drive. Tranquil resort setting. 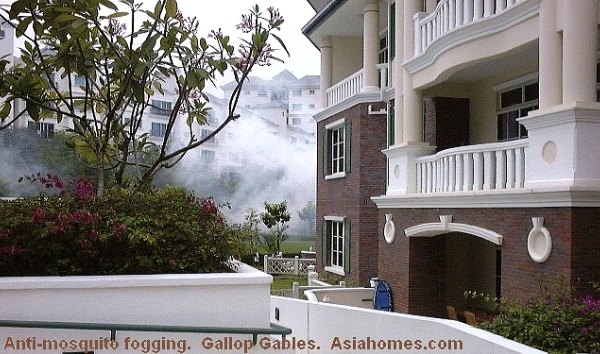 The living area has not much view as Gallop Gables is low rise and surrounded by other condos. The Greyville & Flemington blocks are quieter but face the Sommerville Park or Grandeur condos. Not near the subway in 2009 but a new subway may be ready in 2012. There are many taxis and executive express buses to Orchard Road and Raffles Place/Suntec City. 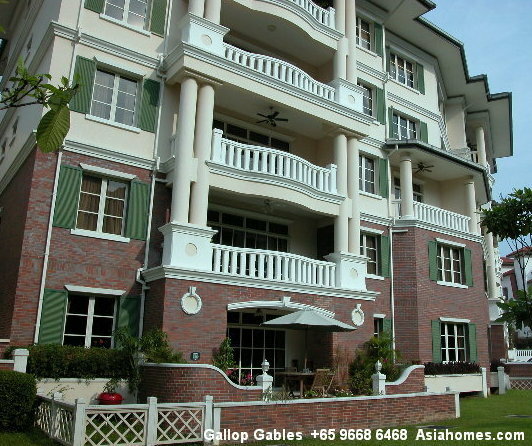 Besides proximity to Orchard Road and international schools, why is Gallop Gables favoured by Caucasians? 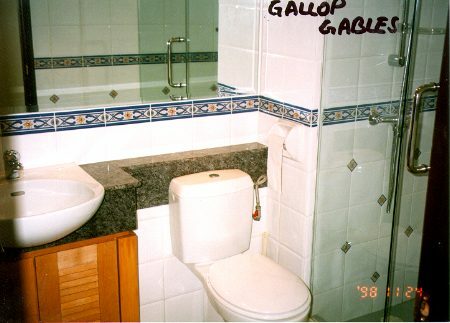 There are many characteristics such as High quality finishes of bathrooms. Basement car park with individual store room or locker for golf sets. 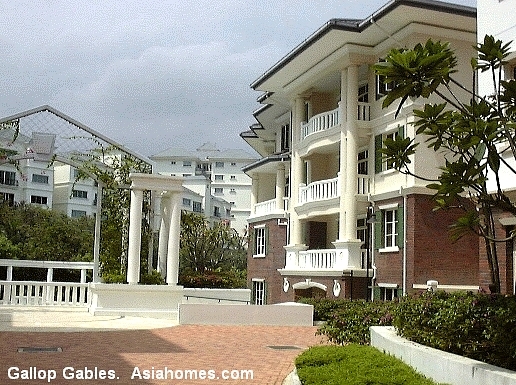 E-mail judy@asiahomes.com or tel: +65 9668 6468, 6254 3326, to get the latest update to make an appointment to view. 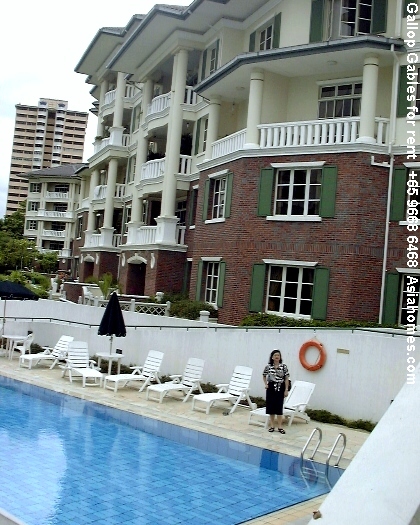 Condos like Sommerville Grandeur and Gallop Gables (image below), off Farrer Road, are favourites with the Caucasian families as they are a 5-minute drive to Orchard Road, less than 10 years old and are near the "Holland Village" where expats congregate for lunch and dinner. They are also within a 15-min bus ride to most International Schools and are at the door step of the beautiful sprawling Botanic Gardens. As an alternative to Gallop Gables condos, the nearby but older upgraded Sommerville Park condos have been very popular. Big living and separate dining areas (right of image) and balconies off the living area appeal to many Caucasians. Check out details of Sommerville Park and other condos at: Subdivision Rentals. 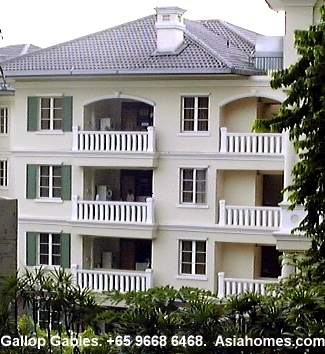 E-mail judy@asiahomes.com or tel: +65 9668 6468, 6254 3326, to get the latest update to make an appointment to view. 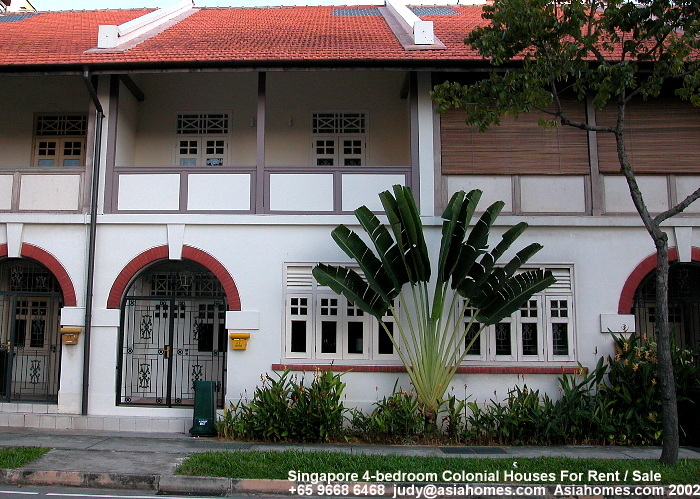 Subdivision Rentals for more listings of Singapore properties. Townerville colonial houses for rent.